StarTech sent their new SATSAS425BK hot swap enclosure after the recent review of the StarTech SATSASBAY425 unit. Both enclosures allow for four 2.5″ devices to occupy one 5.25″ bay. 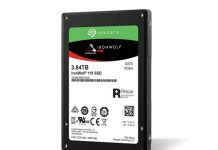 The big benefit here is that one can attain a higher level of density, especially with SSDs and turn 5.25″ bay slots into something more relevant for today’s use cases. 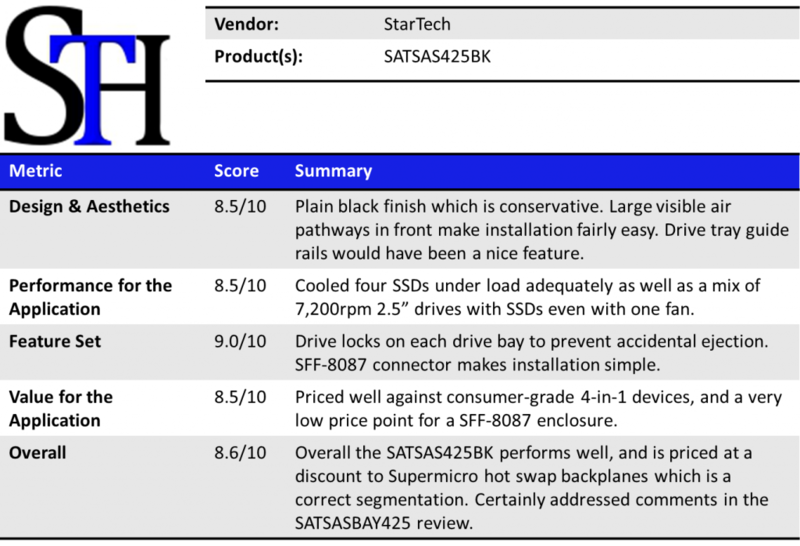 Much of the feedback on the SATSASBAY425 was that it lacked locking mechanisms on the drive sleds and that it still used 7-pin SATA/ SAS connectors instead of a single SFF-8087 connector. 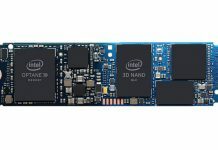 Overall, this provides a good mix of drive connectivity alongside a fairly fast test platform. Personally, I like to label trays to ensure I know exactly which controller they are hooked into and what drive or RAID array they belong to in the OS. Being able to easily trace hardware to software layers is always a best practice. Traditionally 5.25″ bays were a common hard drive form factor until about the days of the Quantum Bigfoot in the mid-1990’s. Since then the 5.25″ bays have been normally reserved for full size optical drives. With hot swap drive enclosures, these 5.25″ bays can be re-purposed to accommodate either 3.5″ or 2.5″ drives. 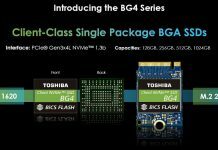 Using 4-in-1 and 6-in-1 hot swap enclosures, a user can get much higher drive densities out of traditional server and tower enclosures when using 2.5″ drives. The StarTech SATSAS425BK is a standard black coloring which matches today’s almost defacto server coloring. Each drive tray on the StarTech SATSAS425BK has a locking mechanism that prevents accidental removal of a hot swap drive in the enclosure. Placing that locking mechanism in the locked position prevents the tray lever from being activated. I did want to highlight that the StarTech SATSAS425BK has four drive trays that are very minimalistic. Basically they have the latching mechanism, the lock, and a piece of metal to secure the drive onto. Installation in this type of tray is very simple as all screws are attached between the bottom of the drive and the metal part of the sled. Some other designs require screws to be installed on both sides of drives which generally take a few seconds longer to service. Inside the StarTech SATSAS425BK we see four power plus SATA/ SAS combination connectors and a PCB that has status LEDs (the light from which are passed underneath the drive trays via pieces of plastic.) One thing you can see from the interior shot is that the only guide rails are those at the bottom of each of the four 2.5″ drive slots. This means that installation of the drive trays requires one to slide the tray along the bottom guide rail. Since there is no top guide rail, this is a bit trickier but not overly difficult. The rear of the enclosure uses a four pin Molex connector for power. Data is handled by the SFF-8087 port making it very easy to connect two cables to this enclosure and have power and data connections for four 2.5″ devices. One can see that unlike the SATSASBAY425, the StarTech SATSAS425BK has only one fan in the rear of the chassis. When looking at cooling, I would strongly suggest this is best for SSD applications as there is ample room atop the 2.5″ drives for some heat to radiate and then be expelled out of the rear of the enclosure using this fan. With that being said this is not the wind tunnel of airflow that we used to see with older generation 15K RPM SAS drives. Having used both, I think the StarTech SATSASBAY425 is a great device, but I prefer the SATSAS425BK because it is much easier to use. First, drive installation requires four screws to attach to the no nonsense drive tray. Second, the single 4-pin Molex power connector and the single SFF-8087 data connector make installation very simple, especially since one can use a standard SFF-8087 to SFF-8087 cable commonly used with RAID controllers. Compared to individually wiring drives, whereas one would need to connect four power connectors and four 7-pin data connectors otherwise the SATSAS425BK requires only two. Third, adding the drive tray locking mechanisms helps secure drives from accidental disturbance when being transported to the data center and when drives need to be swapped. Having hot swap chassis in place of traditional 5.25″ optical media drives makes a lot of sense these days, and the StarTech SATSAS425BK is an excellent option for those looking with a retail price of around $70. Hard to understand model names but I prefer this to the other startech one you reviewed. What kind of drive heights does this 4 bay unit support? I know the 6 bay units are capped at 9.5mm but what about these 4 bay units? I was looking at some of the thicker 2.5″ drive options and wondering. The enclosure with the SFF-8087 port supports 15mm drives (this includes the new WD “Green” 2tb 2.5″ drive, among others). – sas enclosures feature connectors for the 2nd data channel sas hdds usually have?
. driving activity, failure and drive locator leds. These info come in hand when you have a degraded raid 5 array and want to locate the faulty drive. Hardware controllers (like the lsi or hp Pxxx ones) directly use the enclosure (via SES) to indicate the faulty drive. If every review of drive enclosures does not get the max points because these features are missing, maybe then the manufacturers will spend the additional dollar and integrate the enclosure chip.